Connect a DVI display to a Micro HDMI enabled device using a standard DVI-D cable. Need to connect your Micro HDMI® equipped phone or laptop to a DVI-D digital display? This 8 in. Micro HDMI to DVI adapter provides the perfect solution. Connect your Micro HDMI laptop or mobile device to a DVI-digital monitor or projector. 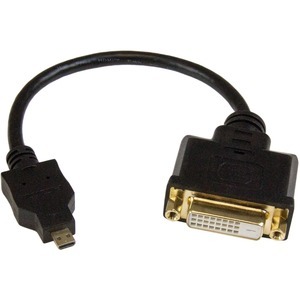 Simply plug any male-to-male DVI-D cable, such as our DVIMM3" text="3ft DVI-D single-link cable (DVIMM3) from the display into the adapter and connect the adapter to your device. Need a way to include audio in your presentations? You can use our MU3MMS" text="1m 3.5mm audio cable (MU3MMS). The HDDDVIMF8IN Micro HDMI to DVI adapter is backed by StarTech.com's lifetime warranty.